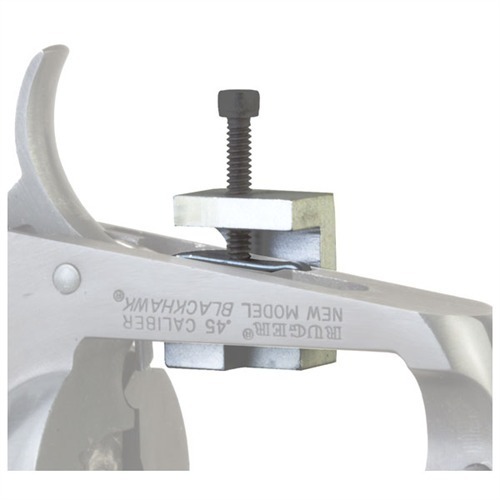 Holds the gate detent spring to release its pressure from the hammer and trigger pivot pins, plus the hammer and trigger/transfer bar groups. Holder gate detent våren å slippe trykket fra hammer og utløser pivot pinnene, pluss hammer og utløser/overføring bar gruppene. I purchased this tool several years ago and have never regretted it. This tool makes performing this operation very simple. Like the instructions say it is that third hand needed to do this. While the concept for this tool is excellent the execution was poor. I don't know if it will work on other Ruger SA revolvers but it definitely will not fit on a new model Single Six. The space between the tool wall and the adjusting screw shaft is not sufficient to fit the receiver side on a Single Six (without modification). I am a big fan of Brownells but I would take the Brownells name off this tool until some modifications are done. This is a must have for anyone that ever disassembles a ruger single action. Its really makes it much eaiser & works just as they say it does. Screw contacts pistol frame, and will not screw down to compress spring when tool is attached to Vaquero frame. Tool needs hole relocation in order for screw to contact spring. Gate Detent Clamp 050806104785 Holder gate detent våren å slippe trykket fra hammer og utløser pivot pinnene, pluss hammer og utløser/overføring bar gruppene.